Even though I wholeheartedly believe that lifestyle changes are the true key to long-term success, I can’t deny the appeal – and success – of a lot of short-term diets or challenges. Part of why 10-, 14-, 21-day or 4-6 weeks challenges are so successful is because they’re temporary. Having that end-date in mind is really helpful at getting you to commit to the program and to propel you through temptations periods of low motivation. After all, it’s not like you have to do it forever, just for X days. One of the primary issues with these approaches is that you work really hard during that time but don’t have any idea what to do once the challenge ends and you don’t have the “rules” or accountability, anymore. 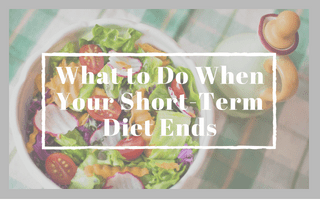 This article will show you how to transition from a short-term challenge or diet to a more sustainable, long-term approach. You’ll learn how to expand your diet to include some of your more indulgent faves without sabotaging your results and hard work. Before you wrap up the challenge or diet, start compiling a list of all the positives that you’ve accomplished during it, to include lessons learned, things experienced, and accomplishments, however small. Write it all down so that you have a list of all the things you just worked so hard for. Keep this list somewhere you’ll see it daily and use it to help you continue down the path of healthy living. That way, when you’re feeling tempted (which will happen), you have a way to remind yourself why you’ve undertaken this lifestyle change in the first place. If you decide to indulge to celebrate hitting your goals or making it through the challenge or diet, do not let that snowball into a whole day, week, or month of going wild. One celebratory meal won’t hurt you (and may even help you) but don’t go off the deep end and throw away all the hard work you just put in to reaching those goals. Don’t force yourself to indulge in foods that you might not be craving. When you first started your challenge or diet, you might have had some really strong cravings. Over time, though, most of these probably waned as your body and brain adjusted to your new style of eating. You may have even forgotten about a lot of them altogether. Just because you wanted something when you started, doesn’t mean you have to have it now just because you can. You could have indulged all along. You just chose not to because your goals were more important. That hasn’t necessarily changed so don’t force yourself to eat all the things just because the diet is over. If anything, pick 1 or 2 favorites that you’ve really missed and indulge in them moderately. If you’ve done an elimination diet with intentions of reintroducing foods systematically to see how your body reacts, especially, this is arguably the most important time of all. Don’t throw away all the sacrifices you’ve just made – see the reintroductions through to the end so that you actually learn from the experience. Stick with consistent exercise. Assuming you partook in a challenge that incorporated exercise, take a minute to think back to day one when you were too sore to navigate the stairs. Acknowledge how much you’ve improved since then. Not only that, but think about how much you could improve in the next 6 weeks, or 6 months if you just keep showing up and working hard. Stay mindful of portion sizes and continue focusing on whole, unprocessed foods for most of your meals. Need some help with these two? Download your copy of the Body Transformation Guide for 30-days of workouts and everything you need to know about healthy eating. If you are at a healthy weight/body fat or just want a break from restrictive dieting, begin increasing your daily intake little-by-little until your weight stabilizes. That will be the intake where you’ll be able to maintain your new weight. This may be less food than you were eating prior to the diet or challenge because now there’s less of you to sustain. If you want to continue to lose, but in a more sustainable and less restrictive way, consider the 3-phase approach outlined at the end of this article. Regardless of method, after a few months of dieting, it’ll likely be in your best interest to take a break by increasing your intake, even if you’re not yet where you want to be. You can learn more about diet breaks here.